Illustration of the interior of a deep space habitat. Credit: Nasa. 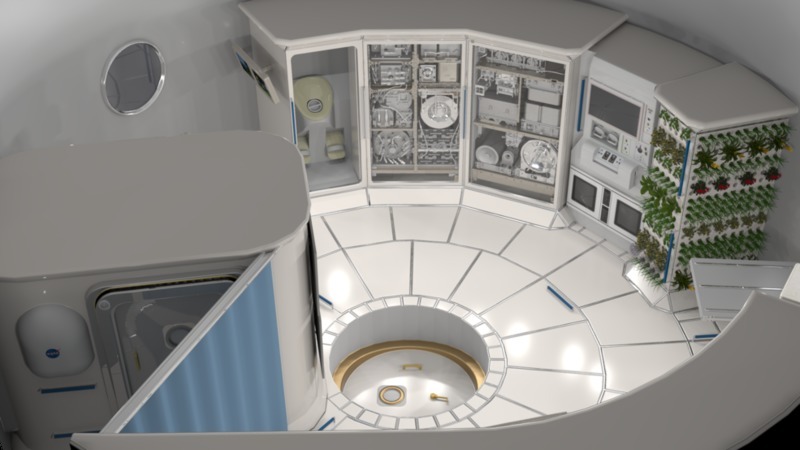 The space agency intends to exploit automated technologies in order to keep space habitats operational even during the absence of astronauts. The two STRIs selected for the SmartHab designs are Habitats Optimized for Missions of Exploration (HOME) and Resilient ExtraTerrestrial Habitats institute (RETHi). These university-led research institutes will work on the development of technologies to support sustainable human presence on the moon and Mars. According to Nasa, the research performed under the SmartHab programme will complement its other projects to help mature the mission architecture. Nasa Space Technology Mission Directorate acting associate administrator Jim Reuter said: “Partnering with universities lets us tap into new expertise, foster innovative ideas, as well as expand the research and development talent base for both aerospace and broader applications. The agency announced support funding of up to $15m over a five-year period to each STRI. The HOME team comprises academic and research institutions, including University of Colorado Boulder, Carnegie Mellon University, the Georgia Institute of Technology, and Howard University. Sierra Nevada Corporation, Blue Origin and United Technology Aerospace Systems are also supporting the project. University of California principal investigator Stephen Robinson is heading the project. HOME will work on advancing early stage technologies in the areas of autonomous systems, human and automation teaming, data science, machine learning, robotic maintenance, and onboard manufacturing. The institute aims to enable resilient, autonomous and self-maintained habitats for human explorers using technologies. Led by Purdue University principal investigator Shirley Dyke, RETHi aims to design and operate deep space habitats that are capable of adapting and recovering from expected and unexpected disruptions. The institute intends to bring together civil infrastructure and advanced technology fields such as modular and autonomous robotics and hybrid simulation.